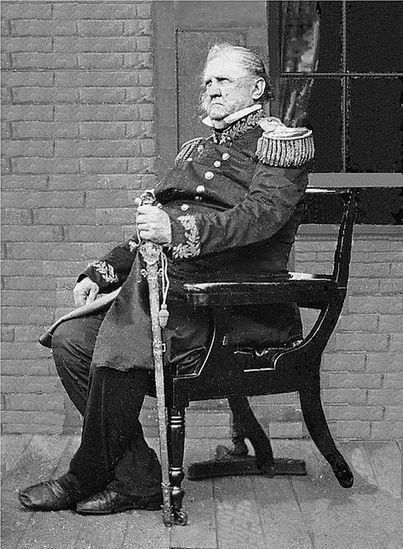 General Winfield Scott in 1862. LOC. 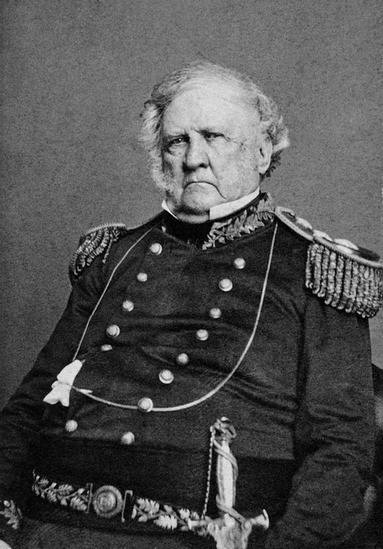 General Winfield Scott in 1861. LOC. WINFIELD SCOTT was born on the family estate near Petersburg, Virginia, on 13 June 1786; attended William and Mary College briefly and studied law in the office of David Robinson; enlisted in Petersburg's cavalry troop, 1807, and became a captain in the regular service, May 1808; received a one-year suspension for open criticism of General James Wilkinson, 1810; served in New Orleans on General Wade Hampton's staff, 1811-1812; was promoted to lieutenant colonel, July 1812, and colonel, March 1813; served on the Niagara front in the War of 1812, was captured and paroled, then participated in the actions at Fort George, where he was wounded, and Uphold's Creek; was promoted to brigadier general, March 1814; as a brigade commander, was largely instrumental in American successes in the battles of Chippewa and Lundy's Lane (where he was seriously wounded); for his valor, was brevetted major general, July 1814; supervised the preparation of the Army's first standard drill regulations and headed a postwar officer retention selection board, 1815; visited Europe to study French military methods, 1815-1816; held regional command in the Division of the North, 1816; married Maria D. Mayo, 1817; was president of the Board of Tactics, 1815, 1821, 1824, and 1826; commanded the Eastern Department, 1825; his resignation at being passed over for Army command refused, 1828; again visited Europe, then resumed command of the Eastern Department, 1829; his field command of the Black Hawk War forces forestalled by cholera among his reinforcing troops, 1832; was an effective presidential emissary to South Carolina during nullification troubles; commanded the field forces in the Second Seminole and Creek Wars, 1836; was cleared by a court of inquiry on his handling of both operations; assumed command of the Eastern Division, 1837; was dispatched to maintain order on the Canadian border where American patriots were aiding Canadian rebels seeking an end to British rule; supervised removal of the Cherokees to the trans-Mississippi region ("Trail of Tears"), 1838; negotiated a peaceful resolution to the boundary dispute between Maine and New Brunswick, 1839; was promoted to major general, June 1841; was commanding general of the United States Army, 5 July 1841-1 November 1861; led American forces in the decisive campaign of the Mexican-American War from the Vera Cruz landings to the capture of Mexico City, 1847; was the unsuccessful Whig candidate for president, 1852; received the brevet of lieutenant general by special act of Congress, 1855, retroactive to the date of Vera Cruz; settled the Anglo-American dispute over San Juan Island in Puget Sound, 1859; retired from active service, November 1861; died in West Point, New York, on 29 May 1866. Scott was a profoundly courageous man with a flair for the organizational side of military life. Yet an unseemly amount of ambition and vanity marred his character, even as these qualities help make him an interesting subject for Eisenhower (who is, you guessed it, the son of Ike). Agent of Destiny is a skilled portrait of a man who is often overshadowed by the generation of Civil War leaders following him. Eisenhower deserves our thanks for writing this magnificent book about a vital figure.